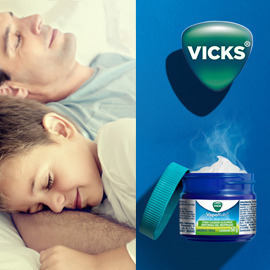 Vicks is a powerful medicine and care that provides you with relief. After taking Vicks, all your symptoms are relieved, since Vicks has an active ingredient to treat each one of them. It works for the person as a whole and helps people feel themselves again – feel gloriously normal. This is a strong benefit that Vicks wants to communicate in a friendly, impactful and truthful way to the many consumers who suffer from colds. In a print ad and a short story, show us how it feels after Vicks relieves the congestion symptoms of your cold. We’re expecting impactful yet simple print ads that set out the benefits of cold and cough relief by focusing on the solution, not the problem. . Your print ads need to be catchy, appealing to as many people as possible and communicate clearly and simply the benefits of relief. Send us your entries by July 12 and win up to €2.500!